Remo 25 x 14 Inch Djembe Key Tuned Adinkra DJ 0014 24. Leon Mobley Signature Series standard key-tuned djembe with 8 lugs. The Adinkra design printed on one of the new fabric finishes in Remo's DESIGNER'S TOUCH graphic arts line, gives this shell the look of hand painted wood. This beautifully designed Adinkra djembe exemplifies Leon Mobley's passion for playing the djembe as well as his deep rooted respect for the traditions of his ancestral Africa. He believes in Unity, Peace, and Passion for playing and shares his joy with the world, whether on stage with Ben Harper or in a drum circle. Remo djembes are based upon the traditional drums of the West African Mandingo people, originating from the great Mali Empire of the 13th and 14th century. In Africa, one of the Djembe's functions is as a healing drum. Remo Djembes are based on the same traditional Djembe tone and form combined with Remo's modern advances including a wide range of tuning systems, heads, finishes and sizes. 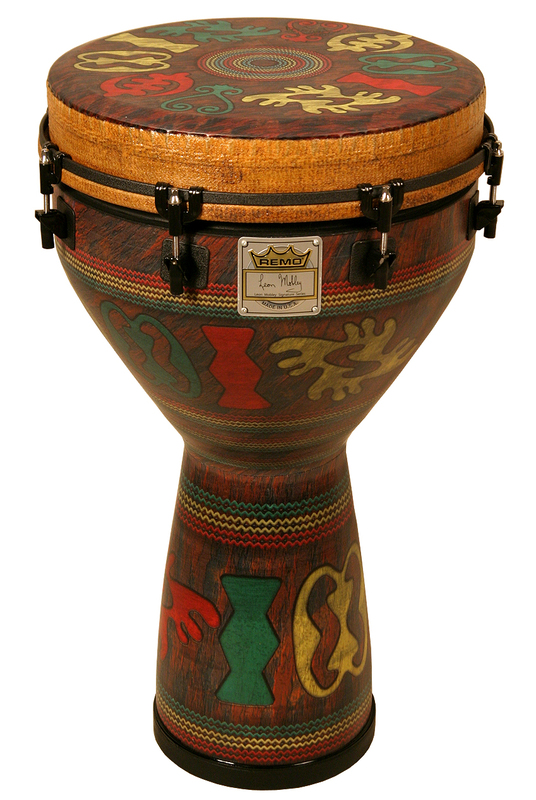 REMO'S key-tuned djembe have had great success as the most user friendly djembe in the world. With features like portability, tunability, durability, and playability it's no wonder why it is the choice for thousands and thousands of professional and recreational drummers for years. The key-tuned Djembes are the most popular of Remo's World Percussion instruments. They're as wide used by touring professionals as they are in drum circles. The high slaps and deep bass tones from all Remo Djembes are from the Type 2 Fiberskyn 3 drumhead and ACOSTICON shell. There are 4 lugs on the 10 in. model, 6 lugs on the 12 in. and 8 lugs are used on the 14 in. + models, all in a Earth-pattern FabriFinish covering.